Mount LeConte and its impressive triple peaks is the most prominent feature of the Great Smoky Mountains National Park (GSMNP) on the Tennessee side of the Smokies and is accessible by hiking or by horseback on only 1 trail. Mount LeConte is 6,593-feet at its peak and is the 6th tallest mountain east of the Mississippi river. 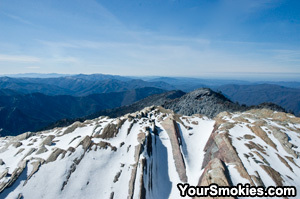 It is only 91 feet shorter than the tallest peak in the East, Mount Mitchell. and 50 feet shorter than Clingmans Dome (accessible by car). 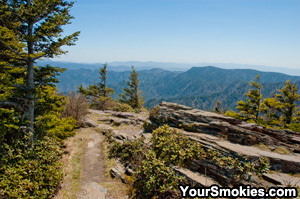 Trail heads to the shortest routes to climb up Mount LeConte are along Newfound Gap Road on the Tennessee side, on Roaring Fork/Cherokee Orchard Road Area and the Appalachian Hiking Trail entrance at the Newfound Gap Parking area. On the top of Mount LeConte there is a shelter where you can spend the night and during season, the LeConte Lodge which can house up to 60 people in a collection of primitive cabins (reservations required). Tent camping is not allowed on Mount LeConte, along any primary hiking trails to Mount LeConte or on the Appalachian Hiking Trail in the GSMNP. The major appeal of Mount LeConte is the amazing views which you can enjoy from any hiking trail all the way up to the summits as well as the breathtaking views up top. Of the 4 hiking trails up to Mount LeConte, 2 have beautiful waterfalls! Fortunately Mount LeConte is located in the Great Smoky Mountains national park which is a federally protected Biosphere as there are a surprising number of extremely rare endangered species that make Mount LeConte their home. Besides the very unique biodiversity and interesting geological features found on Mount LeConte, the peaks of this mountain tower more than 5,000 feet above the valley floor below in Gatlinburg which is a remarkable change in altitude and yet enough for a good hiker to cover in a day and be able to return. The views from the top of Mount LeConte 3 popular look out points West point, Cliff Top and Myrtle Point can be breath taking year round, but be warned, weather can change fast on Mount LeConte and what can start out as a picture perfect day can have you mired in pea soup thick fog by the time you reach the top which can last for days. The experience of climbing up Mount LeConte any time of the year is remarkable if not life changing regardless of the time of year. Summers are lush and vibrant with lots of activity and people moving up and down on the various trails, while spring can offer carpets of wildflowers on the way up and a little bit more solitude. One of the busiest seasons in the Great Smoky Mountains is the fall leaf season. While the top portion of Mount LeConte is evergreens and low bushes, climbing up through dense forests with the brilliant color of autumn leaves and then from the top looking out of the Money Painting like color of the mountains and valleys below you is a sight you won't forget. In the depth of winter, especially with snow on the ground, you may find that you there is no one else on the trails or the mountain all day long. Trees can sparkle like jewels crusted with snow and ice and the long range visibility on a cold dry day seems to be limitless. Even if it is brutally hot in Pigeon Forge during the summer, you will find it cool if not downright cold on the top third of the Mount LeConte Mountain so dressing well in layers including a waterproof shell is crucial to your comfort and safety. It is rare for the temperature on Mount LeConte to ever get above the mid 70's in the summer and has never broken 80 as long as records were kept, that is until June 30th, 2013 when the LeConte Lodge recorded a record 81.4 degrees! In the winter snow can come fast and get deep. I have experienced day time temperatures of less than 10 below and the winds can be powerful, relentless and quickly unbearable. Deep snow saps your strength when hiking and can cause you to rapidly overheat, however a slip on an icy hiking trail and you can slip over the edge or break a bone or worse. While hiking up Mount LeConte does not require a marathon like mountain climbing, not being prepared in gear, knowledge or in a reasonable physical condition would be a major mistake. Simply practicing beforehand - with your gear - can make all the difference. In terms of gear, besides having the right, and enough clothing is important. Cotton clothes, especially in winter is not adequate. In the summer and warmer weather in spring and fall, you should use a backpack to carry excess clothes so that you don't have to overheat wearing extra clothes at lower elevations. You also need to make sure you a hydrated and have enough water to make it to the top. If you have to ration water, you are not bringing enough. 2 liters of water are considered a bare minimum and liters is ideal for most. When the LeConte Lodge is open, there is safe drinking water you can use to fill your bottles or your backpack hydration bladder. When the LeConte Lodge is open during season, you can purchase a lunch to eat up top or eat along the way back down the mountain.